CHICAGO – Inspired by the idea that the history of the United States has been shaped by conflicts over what it means to be free, a new permanent exhibition, Facing Freedom, opened July 4, 2010 at the Chicago History Museum, uses images, artifacts, and interactivity to explore familiar and lesser-known stories from the nation’s past. From women’s suffrage and the formation of labor unions to Japanese internment and a local school boycott, the exhibition highlights some of the ways Americans have struggled to define the meaning of freedom. The exhibition explores four main thematic categories: (1) Public Protest, (2) Armed Conflict, (3) Workers’ Rights, and (4) Race and Citizenship. Each theme is supported by two stories from United States history that present multiple viewpoints allowing visitors to see more than one side of each story. “We want the visitor to realize that everyone takes an active role in history; not just by voting or protesting, but through everyday acts like working and living,” said Peter Alter, exhibition co-curator. An interactive station associated with each story gives visitors a chance to connect to the historic issue or theme and to expand their own views on freedom. Speak Out explores stories of public protest, including the 1963 Chicago Public Schools (CPS) boycott and the culmination of the women’s suffrage movement in the 1910s. This exhibit section invites visitors to consider the question: “How do you make your voice heard?” Protesting against the neighborhood schools policy that led to de facto segregation and to the overcrowding and under-resourcing of schools in predominantly African American neighborhoods, Chicago Public School students took to the streets in the fall of 1963. Through never-before-seen footage recorded by Kartemquin Films, the exhibition documents students’ voices and their march to the Board of Education. The exhibition also explores the history of women’s suffrage from the perspectives of activist women who had diverse ideas about the strategy for achieving votes. It will introduce visitors to these activists, their protest parades, pamphlets and other materials. Visitors will see artifacts such as a suffrage flag, a collection of political buttons, and a “commitment card” that suffragists signed to show support for the cause. Defend, the section on armed conflict, considers the question, “When do you have to fight to be free?”and features stories from Wounded Knee on South Dakota’s Lakota reservation in 1973, and the Civil War in Mississippi in 1863. A 71-day takeover of the village of Wounded Knee on the Pine Ridge Reservation, part of the Lakota tribe, is the setting for a story exploring American Indian rights and loss of tribal land. The exhibition presents multiple perspectives within the tribe, including elders and elected officials, as well as activists from the American Indian Movement, and the Federal government. Using an interactive, layered map, visitors will see how the tribe’s land shrunk over 100 years. The second story in this section looks at the Civil War through the unique viewpoints of two individuals: Lucius Benham, a doctor in the Union army, and Edwin E. Rice, an 18-year old Confederate soldier. Visitors meet each of these men at Railroad Redoubt, a battle in Vicksburg, Mississippi, and explore artifacts including Benham’s surgical kit, a rifle, and everyday items such as dominos that soldiers used in camp during the long interludes between their combat assignments. Unite, the section on workers’ rights, invites visitors to consider, “What would you risk to form a union?” This section focuses on the early years of the Pullman Porters union (1920’s and 30’s), and the formation of the United Farm Workers (UFW) in California in the early 1960s. 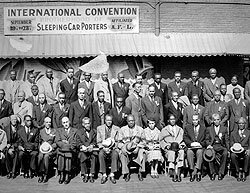 The International Brotherhood of Sleeping Car Porters was formed in 1925 to advocate for better wages and working conditions; in 1937 it became the first African American union to be recognized by a major corporation. This section highlights both the struggle to form the union and the daily activities of a Pullman porter. The second story in this section explores the formation of the UFW and their first national grape boycott that lasted from 1965 – 1970. The story considers the viewpoints of union members and supporters, as well as growers and anti-union factions. The national grape boycott garnered the support of 14 million people at its peak and helped farm workers earn contracts with growers. An interactive asks visitors, if this happened today, what would they be willing to give up to help the cause of others. The Museum worked closely with the Reuther Library in Detroit, the repository of the UFW archives, on this story. Struggle looks at slavery in South Carolina from the 1830s to the 1850s, and Japanese internment in the West from 1942-1945. This section of the exhibition poses the question: “How would you live if you lost your freedom?” The experience of the enslaved population of Charleston, SC forms the centerpiece of a story which also includes a slave auctioneer named Louis D. De Saussure, and an abolitionist named Sarah Grimke. Visitors can touch a replica of a metal collar that was used to punish runaway slaves, hear an audio recording first-hand account of the results of this punishment, see slave tax badges from the museum collection, and learn about the system that allowed owners to rent their slaves, a method of controlling the city’s large enslaved population. The second story in this section, examines the Federal government order, after the attack on Pearl Harbor, authorizing the removal of approximately 110,000 Americans of Japanese descent from their homes to prison camps in portions of the western United States, where they remained until the end of the war. Museum visitors can see artifacts documenting this experience, on loan from the Chicago Japanese American Historical Society, and can empathize with these displaced citizens by taking a loyalty exam that was administered to them. The Museum explored each of these conflicts in our nation’s history in a way that allows for families and visitors to interact with one another, make choices on how they contributed to these events, and ultimately decide their definition of freedom. Facing Freedom, part of The Naphtali ben Yakov Pritzker American History Wing project is made possible through a generous grant from Tawani Foundation and Colonel (IL) J.N. Pritzker, IL ARNG (Retired), President & CEO of Tawani Enterprises, President & Founder of the Pritzker Military Library, and President & Founder of Tawani Foundation. “As the preeminent steward of our city’s past, the Chicago History Museum is the principal location to expand knowledge of our nation’s history. Through their esteemed historians, the Chicago History Museum leads us in experiential narratives and archives of personal stories and important societal issues that have been vital in shaping this country,” said COL (IL) James N. Pritzker, IL ARNG (Ret. ), Founder and President of Tawani Foundation and the Pritzker Military Library. The Chicago History Museum, a major museum and research center for Chicago and American history, is located at 1601 N. Clark Street. The Museum can be reached by CTA buses 11, 22, 36, 72, 151, and 156. Parking is located one block north of the Museum at Clark and LaSalle Streets (enter on Stockton Drive). Admission to the Museum is $14 adults, $12 seniors/students, free for children 12 years and younger. General Admission is free on Mondays. Please call 312.642.4600 or visit us at www.chicagohistory.org. The Chicago History Museum is affiliated with the Chicago Historical Society and acknowledges the Chicago Park District generous support and the Illinois Arts Council’s support of all the Museum’s activities.